Here at FedTech, we are able to process your custom art projects, sculptures and creations with precision and efficiency. 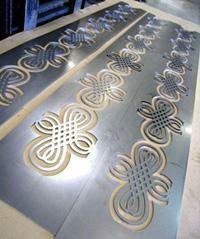 With our waterjet cutting and laser cutting services, we hold the capability to cut nearly any material. We also pride ourselves in quick turnaround times and extraordinary customer service. Whether you are looking to process material for a custom sculpture, a creative art piece, landscape project, or if you're creating custom signage for your business or workplace, FedTech can help you complete your art design parts efficiently. There's no doubt that FedTech has the experience you are looking for. Not to mention, our programmers design each part with tight nesting for maximum usage of material. This keeps customer costs down, and helps keep machine turnaround times quick. FedTech also offers numerous in-house value-added services including forming, finishing, welding, drilling, tapping, countersinking, assembly and more; all in addition to our waterjet cutting and laser cutting services. So when you need one job done or ten jobs done, FedTech is your one-stop shop for completing your custom art pieces. Wondering which process is best to complete your art design project? You can compare the two processes at our waterjet vs. laser page. Typically, waterjet cutting is used to process materials that are thicker than 5/8", or for materials that aren't stainless steel, carbon steel or aluminum. So most of the time, laser cutting is used for processing thin materials of those elements. Curious about how thick we can cut? Visit our thickness page to find out just how thick of parts we're able to cut with waterjet and laser. You'll be surprised at some of the materials we've been able to process, including 10" thick copper bar, and 9.25" thick aluminum. We also process materials that most people wouldn't dream of cutting. 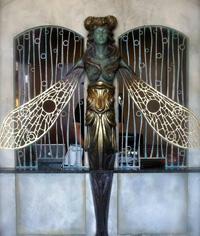 We've waterjet cut glass, tile, linoleum, ceramics, marble, porcelain, and more. If you're not sure if we can cut it, ask! If you have any questions about a custom art project that you'd like to have FedTech assist you with, feel free to contact us. Or if you know what you want and just need some pricing on your art designs and prints, request a quote from FedTech and we'll get you started. Before you leave, be sure to visit our Media Gallery for photos, videos, press releases, podcasts, and more. FedTech is a leading job shop in Minnesota, ISO 9001:2015 certified for quality standards and customer satisfaction. Request a quote today to get a head start on your custom art designs and structural projects. We're here to help you create the best art around. These 16 gage laser cut carbon steel architectural panels were processed at FedTech for a coffee shop. 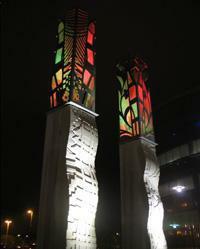 These 22 foot towers were constructed for an airport in North Carolina. Read the full article here. Custom fabricated movie theater art. Read this full case study here.